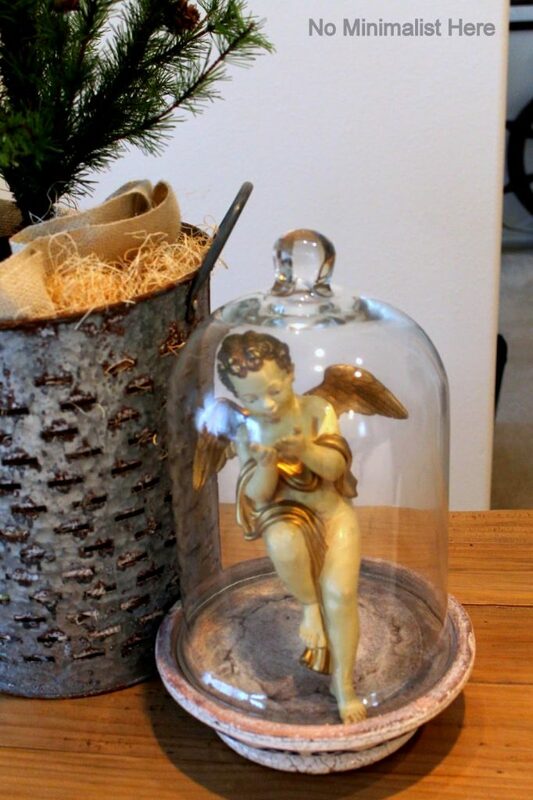 Welcome to day one of the Christmas Open House blog hop. 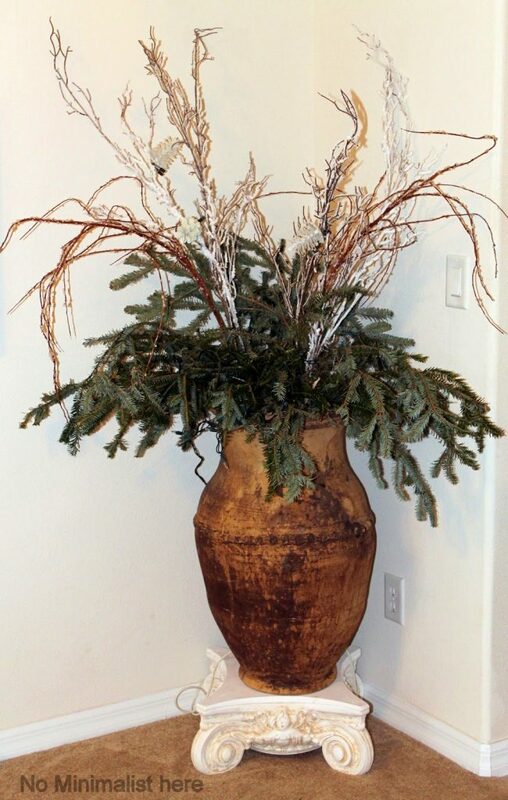 Over the next three days some of my favorite bloggers will share their holiday decor with you. Grab a cup of hot cocoa and enjoy the tour . into an enclosed courtyard. This is my favorite part of our home and I had plans to go all out in this area. I visualized hula hops covered with lights and hung from the screened porch and lots and lots of lights. Unfortunately a back injury required me to reign in my plans, especially any requiring a ladder! We did some simple decorating in the courtyard. 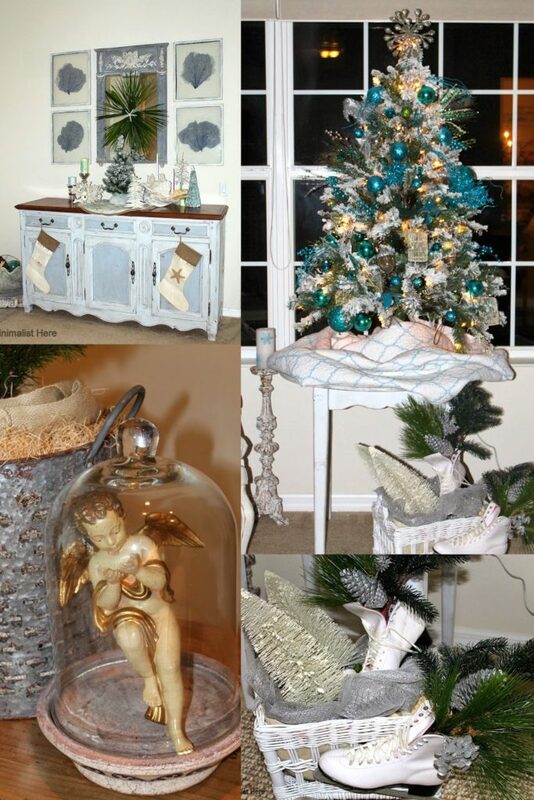 Our little flocked tree is done in turquoise and silver this year and I have several vignettes in the same color. 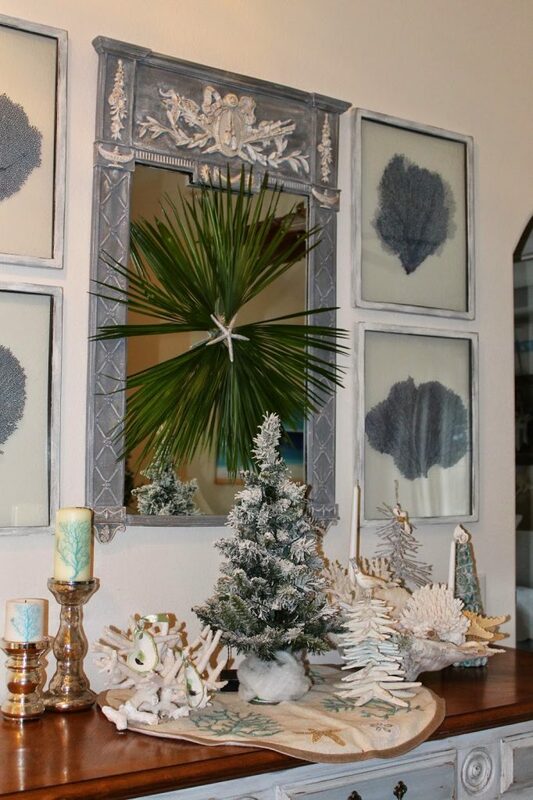 Of course I had to add some coastal decor ….I do live in Florida after all. Aren’t these oyster shell the cutest? These were a win from my friend Ron at Uptown Acorn. 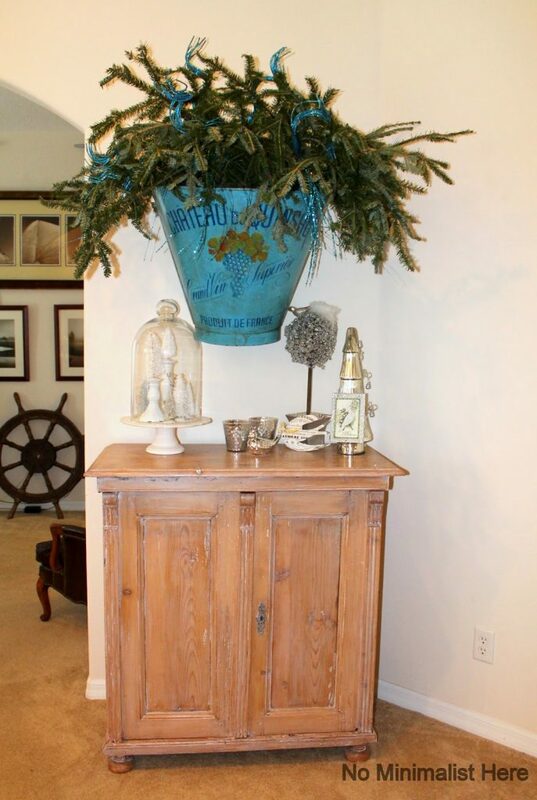 You can see HERE a larger coastal vignette I created in our former home. 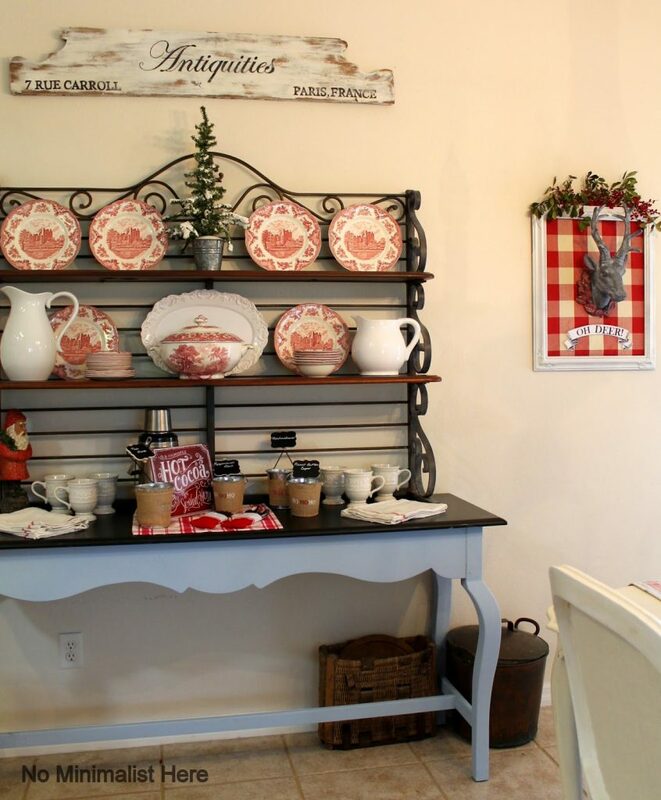 The red and white transferware decided the color of the decorations in the kitchen. Some of you may have seen my post Christmas Project~OH DEER. If you missed it just click on the title and it will take you to that post. We had some of our new neighbors over last night and everyone enjoyed desserts and the hot cocoa bar. Thanks so much for visiting! I am still working on decorating the other rooms and I’ll be back soon to show you more. 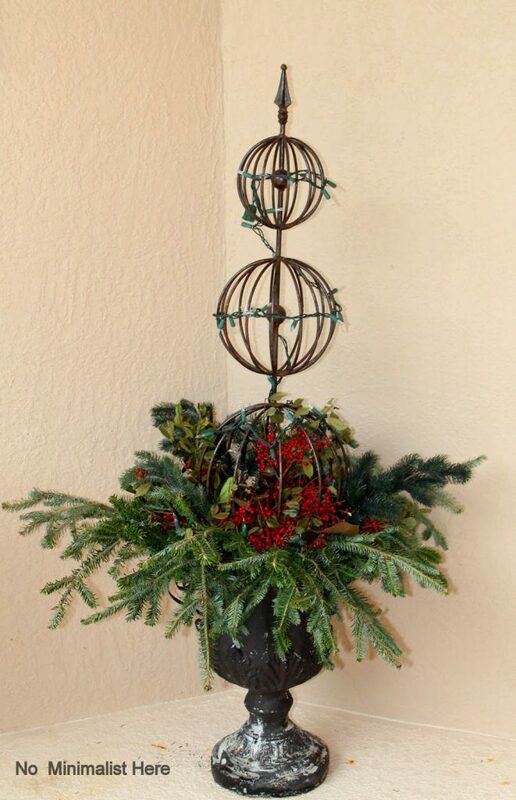 Below is the schedule for the Christmas Open House blog hop. I hope you will visit each of these talented bloggers for some amazing inspiration. 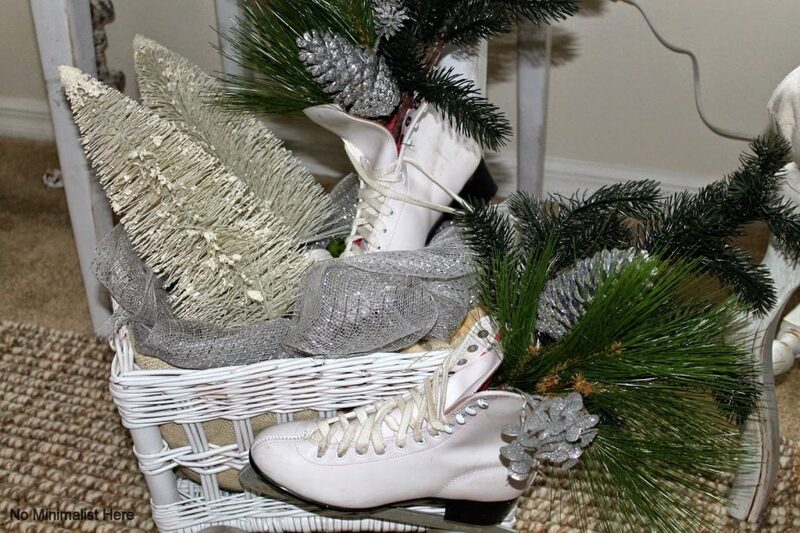 Your new home looks beautiful all decked out for the holidays! I like the blue touches very much. I favor blue at Christmas time too. 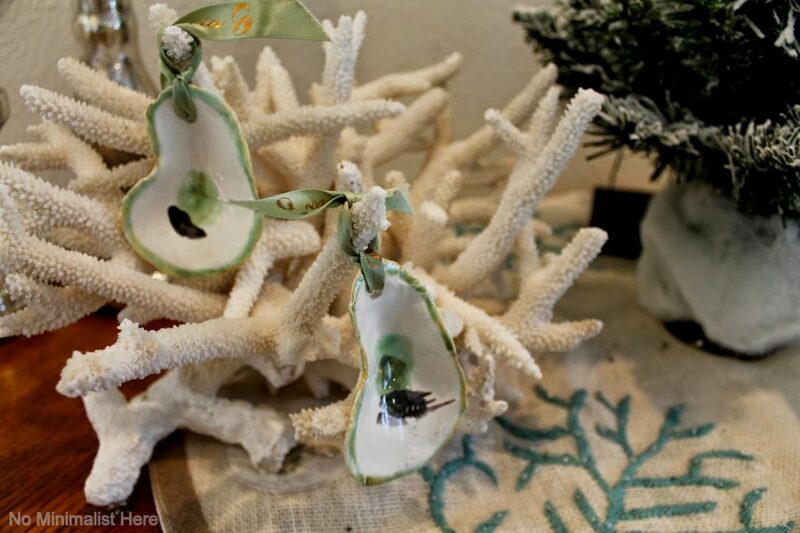 The little oyster shells you won from Ron are perfect for your Florida home too! I hope your back is feeling better now. Everything is just gorgeous! Love all of your Christmas touches. Your house looks amazing! What a treat to tour it! Thanks so much for inviting me again this month. I love your display of the Oysteria shells. Love the incorporation of the beach decor. It all looks beautiful! 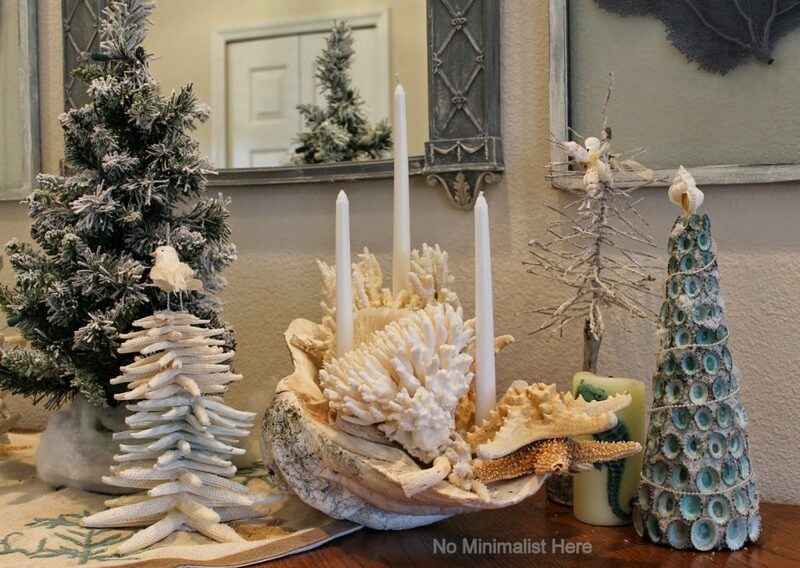 I especially love your coastal decor, those candles are so pretty! Love the colors too!!! So beautiful Sherry. I am loving all the beautiful inspiration of all the homes. Happy Decorating. 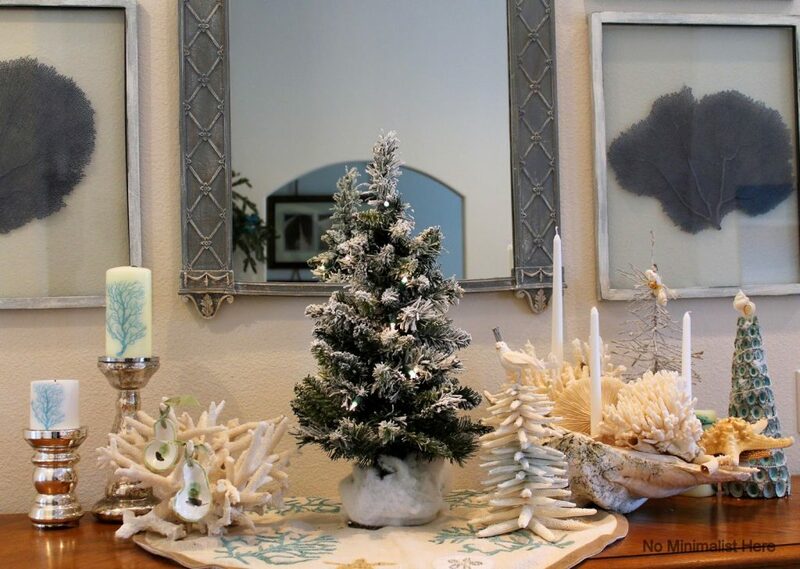 Your house is looking fabulous Sherry, I adore those little oyster shells too, never seen anything like that…has got me thinking for next year as their are loads of oysters in NZ. I have posted a few pics of my Christmas decor on my blog a few days ago, I am still decorating though as I am finishing areas in my house…I am still working on the bedroom reveal and hope to get my bedside tables tomorrow which will complete the room for now. Love all the great decor you have brought along to your "new" home in Florida! I have always loved that "limpet" tree and remember it from your home in Virginia. Thanks so much for hosting the blog hop party for us! 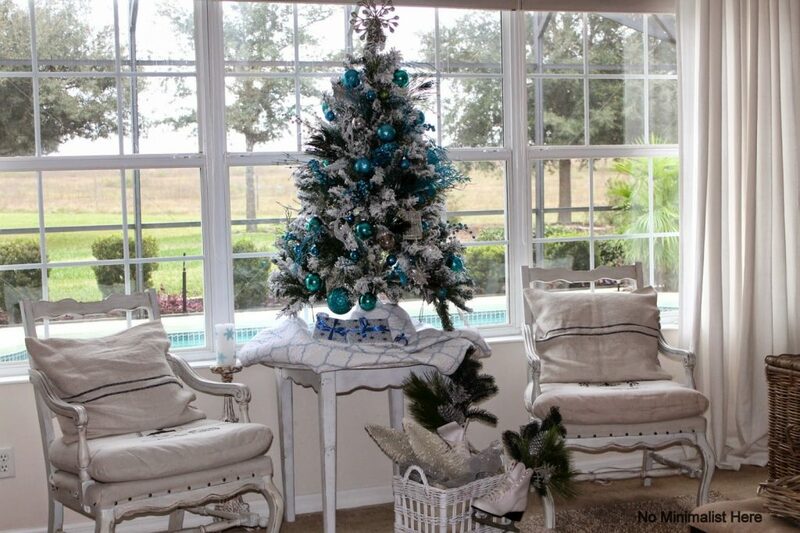 Sherry I love it all…your pretty flocked tree to all the greenery you added around…it all looks so pretty! Thanks again for letting me party with you! 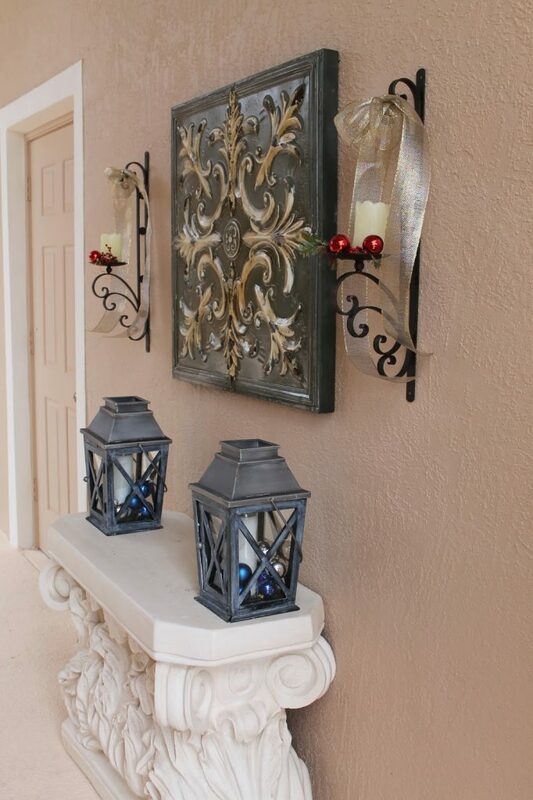 Your new home looks beautifully decorated for the holidays. I especially like the pretty tree between those great chairs. The cocoa bar looks lovely and functional too. Hope your back is well on the mend. Everything is gorgeous Sherry! The turquoise goes well with your new home and environment! Love all the accents you added, I'm sure your Christmas here will be a very special and happy one! Sherry your home looks beautiful! I know I am totally hooked on silver and turquoise this year as well! 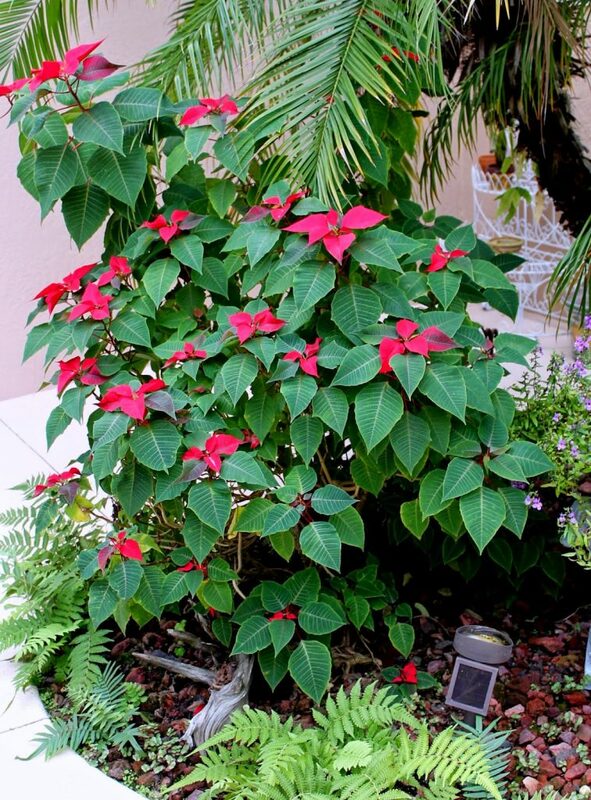 I love the fact that you have a courtyard and your tabletop tree is simply darling! 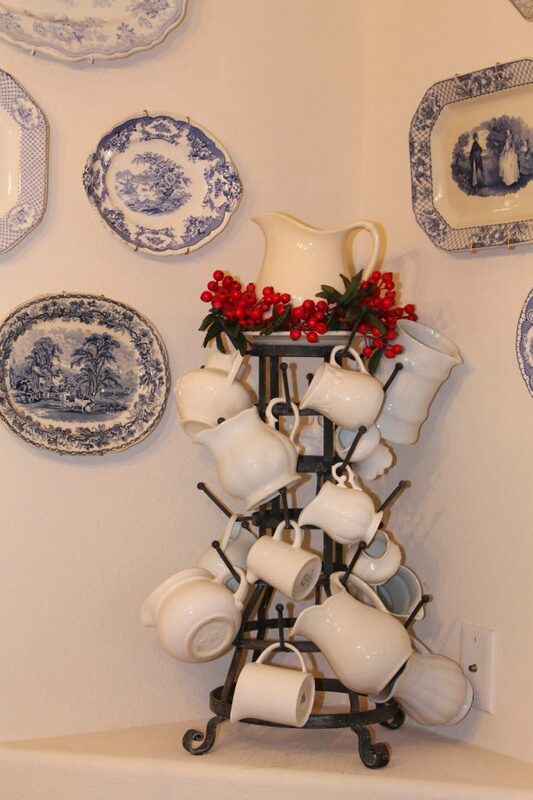 But I am still crushing on your red and white transferware and your amazing oh Deer wall art! Thank you so much for including me in your blog hop again…looking forward to seeing all of the inspiration which will be flying around these three days! Everything looks gorgeous, Sherry and I love the deer! 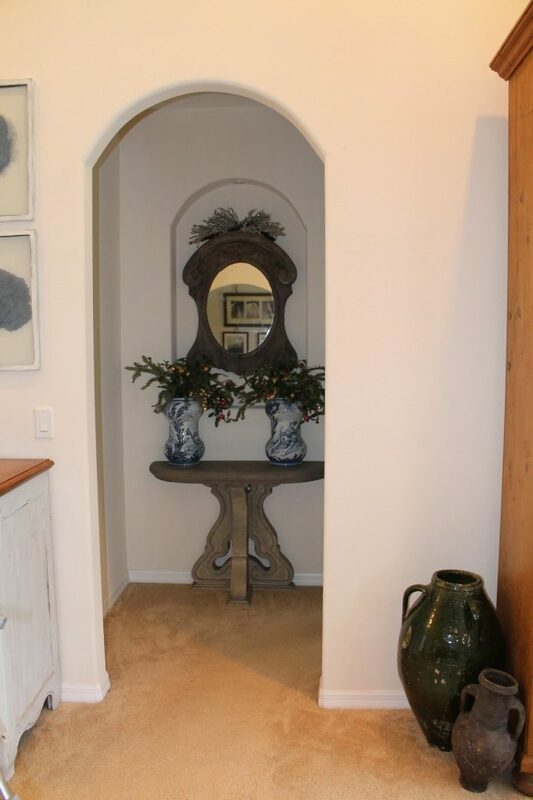 Sherry….you have dressed your beautiful new home so festively for the holidays….love every detail and I am so loving the "oh deer" …. So happy to be a part of this great tour of homes!…. 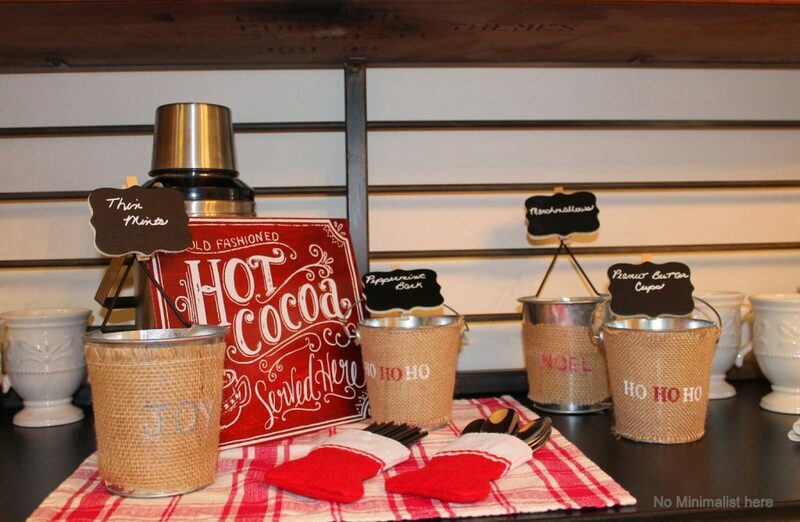 Love the hot cocoa station (in Florida)! Your house looks so pretty. I have always loved all of your blue and white and it is perfect at Christmas. Hope your Christmas is merry and bright – and I hope your back is better. 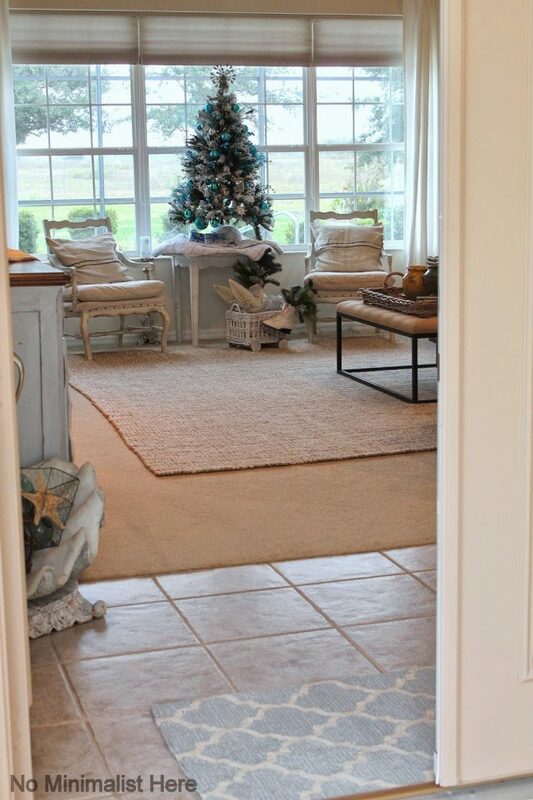 Sherry, your new home looks so festive and elegant. I love your view from your living room too! 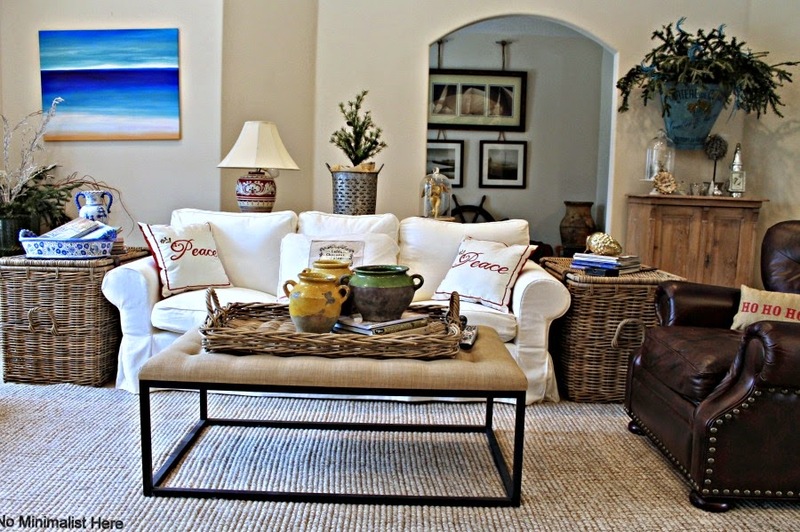 Sherry, I love the way this Florida house is evolving into YOUR home! Everything looks so lovely. Thank you so much for joining Grace at Home. I'm featuring you this week!